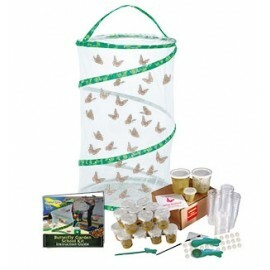 This School Kit Caterpillar Refill is ideal for those teachers and educators who already have the Butterfly Pavilion Habitat and want to experience the Miracle of Metamorphosis with their students year after year. Give every student the gift of a butterfly! The School Kit Caterpillar Refill includes 33 caterpillars and all of the nutritious food they need to develop into beautiful Painted Lady Butterflies. 33 small vials are also provided so each child can carefully house and observe his or her very own caterpillar. Please note: This product is a REFILL and includes 33 caterpillars and food, 33 vials and lids, transfer brush, plastic spoon and feeding pipette ONLY. The habitat is not included. 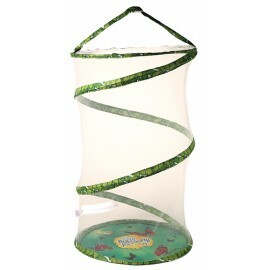 Be sure to provide a Butterfly Pavilion Habitat in which to house your butterflies. As caterpillars are sent on Tuesdays and Fridays only, NEXT DAY DELIVERY is not available for this item. Please note, on receipt, you will need to distribute the caterpillar food into each vial and transfer a caterpillar into each vial. Instructions on how to do this are included.